My last show of the year is just around the corner! I'll be doing my best to rock a table full of swell items at this year's DIYpsi Holiday Market. Stop by and grab some things for the awesome people in your life from a great roster of makers and artisans. Hope to see you there! 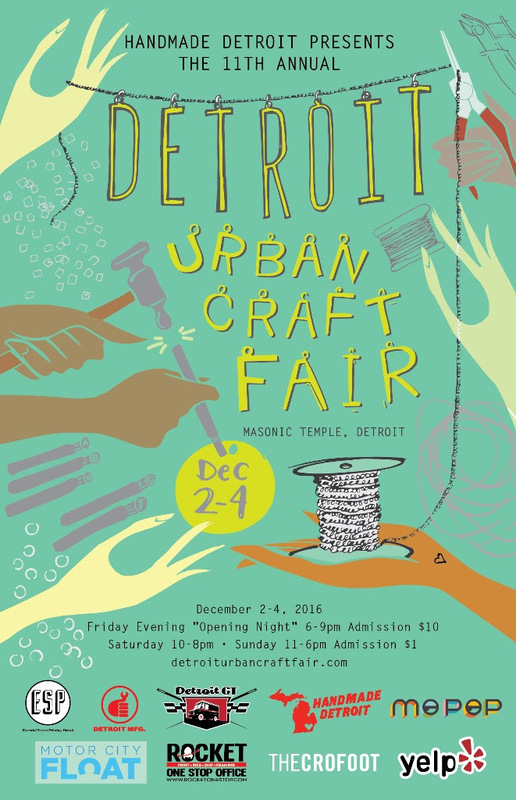 Hey everybody, I'm excited to announce that I will be back at the Detroit Urban Craft Fair this December. Hope to see you there! Hey there guys and gals! I'll be popping up at this year's Maker's Mart at Handmade Toledo. Swing by, say hello and get a jump on doing some holiday shopping for those in your life that appreciate awesome things. Kill Taupe goes up north. I'll be heading to Northern Michigan in a couple weeks to set up shop at the River's End Block Party in Traverse City Michigan. See you there! The Kill Taupe online shop is now part of killtaupe.com. Hurray! Everything in one place. Easy. You can find all the usual arty goodness under the NEW PRODUCTS header. I brought back this zine for a third and final printing. It collects 14 illustrations of rabbits that have a bit of a dark side. Grab your copy here. I'm excited to announce that I will be back in Ypsilanti at the end of August for the DIYpsi Summer Festival. Over 80 vendors are taking over the ABC Microbrewery August 27th & 28th with plenty of art, music and handmade goodness. It's always a good time, so make sure to swing by and say hello over a pint. I had a fun time last weekend with my illustrator pal Heather Hansma, as we traveled all over Metro Detroit hiding tins full of art and other sweet objects. We made drops in Royal Oak, Ferndale, Detroit, Toledo and Pontiac. If you missed out, make sure to follow Kill Taupe on Instagram and Twitter to play along next time. My heart and thoughts are with those in Orlando affected by such atrocious and senseless violence. It is disgusting that one man with a gun can inflict such pain and anguish on the lives of so many. Stay strong Orlando! F(L)IGHT is an exhibition promoting peace through the work of over 140 artists ranging from illustrators and fine artists to animators and street artists from around the world. Each artwork in the show has a white dove integrated within it and a proportion of exhibition sales will be donated to charities War Child and Veterans for Peace. F(L)IGHT is the idea of artist and curator Paul Roberts, who wanted to use his skills to help, insome way, those effected by the bombings in Syria last year and assist charities combatting the countless atrocities around the world. Gathering artists together, that he already knew along with people he had always wanted to work with, the exhibition idea has become reality with many well respected artists contributing bespoke artworks to the show. War Child provide life changing support to vulnerable children whose families, schools and communities have been torn apart by war. Veterans for Peace strive to educate people about the true nature of military service and hope to convince people that war is not the solution to solve problems in the 21st century. Every artwork in the exhibition will be on sale for £50 with 50% profit going to these charities. It is advised to arrive early on the opening reception evening to be sure to secure an artwork of your choice. Any work not sold during the exhibition will be put up in an online shop for one month only to ensure every effort is made to raise as much money as possible for the charities. Here are some places you can find me in the coming months. Swing by and say hello! Hey guys! I’m excited to announce that I’ll be teaming up with Urban Vinyl Daily for the release of the Toxic and Moo! editions of the Chunky Bun. You can find them exclusively at Designer-Con this weekend in Pasadena, CA. Each wood figure is hand painted, stands 6-1/4″ tall and comes with a barrel stack accessory. Both Chunky Buns are editions of three and will run you $75. Nothing ever quite goes as it should in the suburb of Burbanville Heights. At first glance it might look like any other collection of boring pre-fab homes, but in Burbanville Heights the cupcakes have a taste for flesh, citizens are enhanced with robotic components and zombies occasionally rise up to create a hefty amount of havoc. Hey there guys, I'm really excited to announce that I will be opening my next solo show, Burbanville Heights, on September 12th at Forage Space in Scranton, PA. This is my most ambitious show to date and will feature huge character cut out, wood assemblages and lots of other awesome new stuff. I hope to see you there!